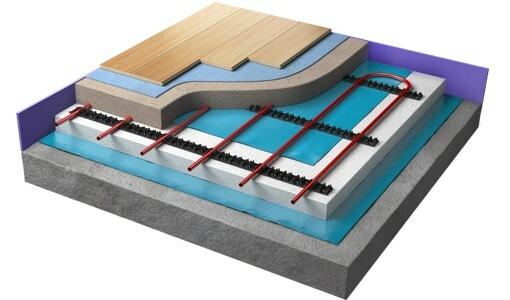 The Metro Rail System utilises a track that fixes to the insulation to securely hold the heating pipes in place, in an optimal layout. It is ideal for use with either floating or bonded screed floors and offers a quick and efficient installation. It is suitable for use with any Warmup heating pipe and is recommended to be installed with the Metro Insulation board. The rail provides guidance on how to install the pipework quickly and at the correct design spacing levels. The system uses pre-moulded retention clips that attach the heating pipe to the rail. The rail features a self-adhesive backing for quick installation and are positioned in parallel runs on top of the insulation layer. The rail and insulation are separated by a plastic membrane, which acts as a moisture barrier. The Metro Rail System allows pipes to be spaced at 50mm intervals. The system holds the pipework into place until the screed is applied. UltraTile from Instarmac provides one of the best screeds on the market for this purpose. It is suitable for almost any floor finish and in particular where the flooring (wood, carpet or vinyl) may be replaced from time to time.